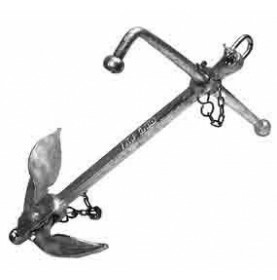 Fisherman anchor in galvanized iron with foldable arms. Comes with galvanized shackle. Available in 4 different weights. 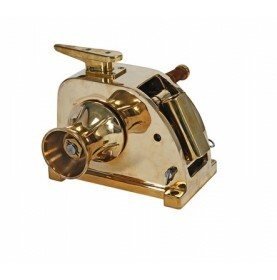 Heavy and robust two gear anchor winch made from high-strength seawater resistant cast brass for yachts and ships of up to a length of 20 m.
On the port side of the winch a strong capstan head (diameter 115 mm) is fitted, which can be used for all kinds of traction work. The solid telescopic handle, made from bronze tubing (diameter 40 mm, total length 0,80 m) also activates the brake nut. This gear drive and all axles are made from stainless steel. In speed gear the hoisting speed is 9 m/min (6,5 double travel per metre).